I was almost pushed into believing Masato would be the lead male. Having passed the exam, April came along quickly and she met up with her (new?) friend, Shibuya Tomochika (or "Tomo", as she seems to want to be called). In the classroom, Otoya tracked her down and she thanked him profusely for having helped her many moons ago. 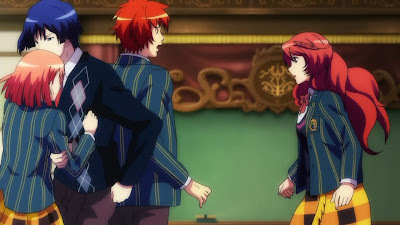 Shinomiya Natsuki went crazy over her likeness to an "Elizabeth" and attempted to pounce, at which point Hirijikawa Masato suavely pulled her away (and pushed Otoya into the line of fire). It was a quick-paced introduction scene and I had to write down the names right away because I didn't care enough to attempt to find them again later. 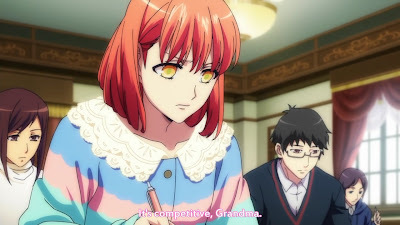 By the way, Elizabeth is Natsuki's dog. What an insult. It would have sucked had she actually fallen. When it was lunchtime, Haruka darted after Tomo to give her a card (to pay with) in the cafeteria and tripped on her own feet. Instead of helping her not fall (she regained her balance on her own), Kurusu Sho picked up the card instead and handed it to her. Ren showed up, making fun of Sho, and Haruka thanked him for his help back then, too. 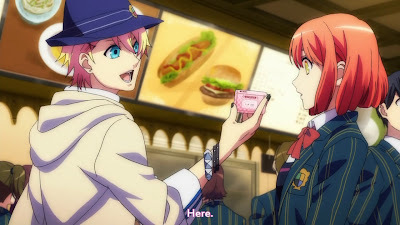 Masato showing up caused Ren to wander over to him in some kind of stare-down, while Tomo announced that Ren was a celebrity due to being the heir of the Jinguji Group. Meanwhile, Masato was his rival due to being the heir of the Hirijikawa Group. On that note, why didn't Tomo announce this earlier, while in the class and during Masato's first appearance? It's like a two-for-one special, announcing them both at the same time. 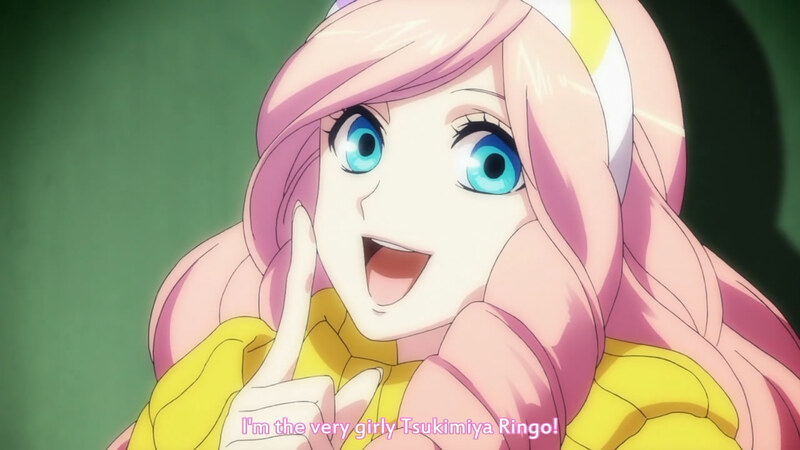 He actually said, "It's 'Kurusu Sho'!" On that note, here's another grievance. I struggled to find a group that was translating this; HorribleSubs released it much, much later from NicoNico. Since it was only a 360p version, I grabbed Vyrsalia's 720p version that utilized the same script. 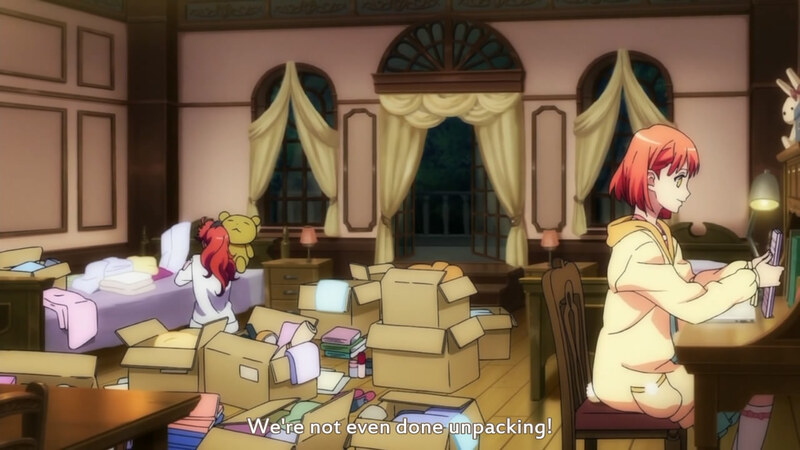 The one I ended up watching today was from NyanTaku, and I was immensely disappointed. Mistranslations are one thing, but the line shown above bothered me the most. It was pretty glaring that Sho was the only one that remained nameless at the end of the episode, which makes it even worse that this line was so butchered. 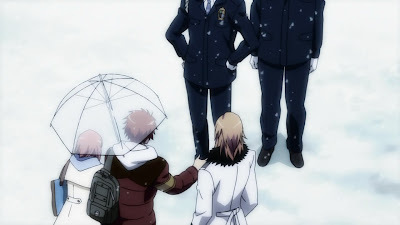 Earlier, too, when Ren was "warning" Sho, he actually said that he had his eye on Haruka from prior, not that she was the lady that he had saved. 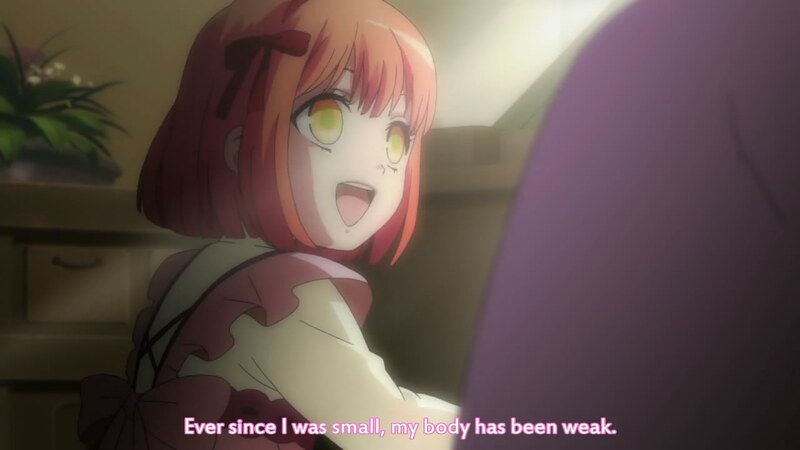 I'll probably stick with Vyrsalia from this point on, although I know nothing NicoNico's subbing style. After the lunch scene, Haruka and Tomo were in their dorm room (so this was probably after the school day was over), wherein Haruka hung up a poster of the idol Hayato, prompting Tomo to ask why she was so into that specific (goofy) idol. Haruka explained that her poor health as a child prompted her to be sent to live with her grandmother in the countryside, but she would return occasionally to the city to visit. On one such visit, she collapsed on the sidewalk, feeling feint and unable to focus. (Why was no one with her when everyone knew she had poor health? Contrived.) That was when Hayato's voice called out to her from the skies (or rather, the TV on the side of the building) and she was astonished by the different way of singing. So she grew up wanting to write a song for him. It's such a typical and overused story. I don't even know what else to say. What kind of unpacking technique are you even trying?! Right after the retelling of her past, the scene shifted to the crazy Principal looking up data on various students and generally being pretty villain-like crazy. When the scene returned to the dorm room, Tomo walked out to get something to drink and a cat visited Haruka. No, I'm not making up things. The cliche continued as the cat jumped onto the bed, grabbed her handkerchief, and darted out. Haruka chased after it (however, not being able to go out the window, it's suspect how she even managed to catch up) to a meadow, where the cat was gone but the cloth was nestled in the flowers. He came out of the trees. His importance is great. It got worse as a boy emerged from the trees, crouching next to the water. 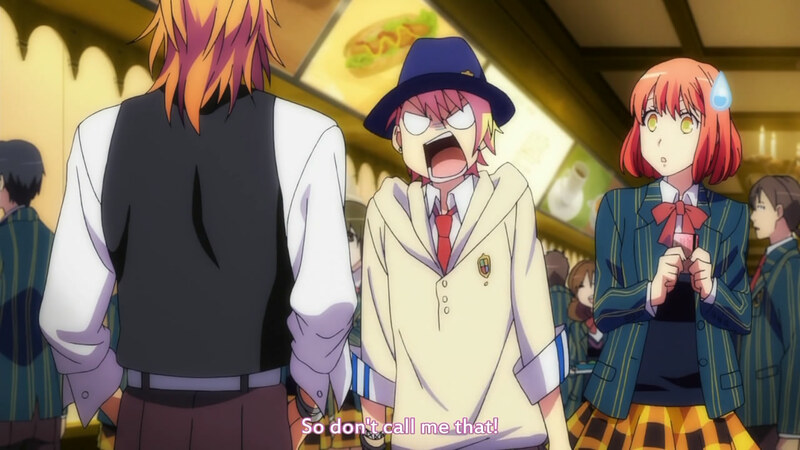 Haruka immediately thought he was Hayato because, truthfully, he looks identical. 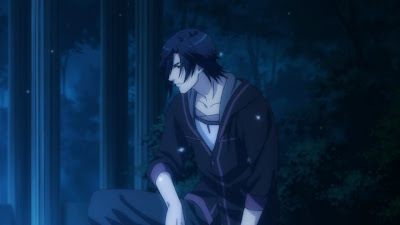 However, he introduced himself as Ichinose Tokiya, and gruffly said to not compare him to the terrible Hayato. If it wasn't obvious from the OP, this seems to be Haruka's main love interest. I wonder what his story with Hayato is (not really, though). Twins? This episode took a lot out of me. I can't stand this kind of shoujo. I generally stay away from shoujo, actually, because much of it is just like this and I hate it. I'll try to do batch posts about this (I need to finish things...), but it's pretty disturbing just how predictable and full of cliches this thing is.